All too often we overlook fly fishing for the pan fish. Too many these are the “kid’s fish” or something to catch when the bass are not biting. They are a good source of fun and food once the water temperature gets into the mid 50-degree or higher range. They move into the shallows to think about spawning. First to move up to warmer water is the males who build nests. The females which lay eggs before departing to the deeper climes follow them shortly. The males move back in to guard the nests and fry until they can forage on their own. At each of these times the panfish can be an excellent quarry of choice for the fly fisherman. Getting started in this sport is easier than catching the fish. All you need are some balanced equipment and a few lessons. As for the tackle, there are kits available from major tackle manufacturers tailored to the individual species, including trout and panfish. These are available at most stores that sell the tackle. Once the lessons are over and you are consistently casting 30 feet with comfort it is time to take to the water. In choosing a fly A few basic patterns work well. There is no reason for a vest full of flies. The easiest way to select your basic flys is to ask another angler for help. Find out what he uses with the most success and buy a few to try out. The local tackle shop may be of assistance but not all of them are really familiar with fly equipment. Flies come in two types wet and dry. 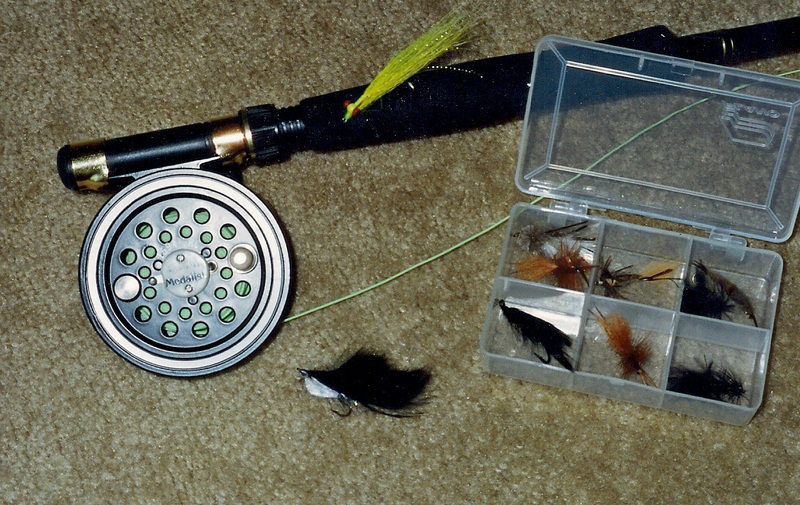 Panfishermen using wet flies try a variety of colors and patterns. Some suggestions include Wooly Worms, small streamers ant or bee imitations. For surface or dry fly fishing nothing beats a small popper or a rubber spider. Trout flies work as well. Hooks should be in sizes 6, 8 or 10. 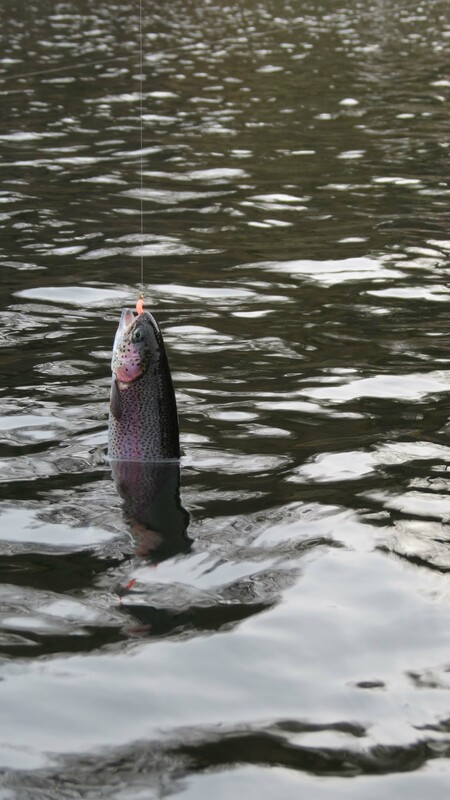 In cooler weather you will want to fish when the sun is high and the water is warmer. Later, as the water warms too much, try the early morning and late afternoon hours. Cast to the shorelines cover such as weeds, pads, brush, logs, rocks and any other available structure. If the bream are on the beds, then that is ideal casting territory. After casting, allow the fly to sink slowly before retrieving it. Remain alert as most strikes occur on the fall. The strike will usually not be one of those rod bending types but rather a twitch in the line. There is no need to set the hook hard. The strike is just a matter of the fish sucking the fly into his mouth. Just lift the rod straight up. This increases your chances of a proper hook set in the upper lip. It keeps the fish from inhaling the hook too deep to allow for a safe release. It is easy to keep from yanking the hook right out of their soft mouth. Surface fishing is the most entertaining. If the mayfly hatch is on, then crappie will take poppers with gusto. Little rubber spiders work well for bream around pads and stumps. With the surface action the angler can see and hear the strike. For the nighttime angler, only the splash is audible. Nighttime is the prime time for feeding as the bugs come out. One might even pick up a bass or two with those poppers. Even on the best of nights, the fish will eventually turn off. No one knows why, it just happens. Pack it in and go clean fish. There will always be another day. The 155 miles of Rock River that flows through Illinois from the Wisconsin state line to near Rock Island on the Mississippi River divides into three basic habitats for fish. They are tailwaters below dams, lake or sloughs above dams, and the main channel or side channels. 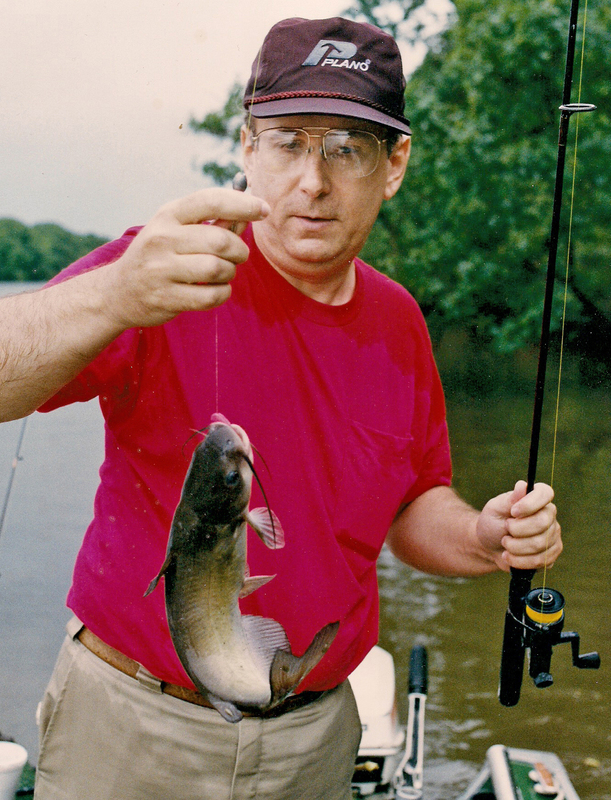 A very comprehensive booklet on “Fishing the Rock” is available from the Illinois Department of Natural Resources offices in the area or on line at http://www.dnr.illinois.gov. Below each of the seven dams, the tailwaters are accessible for fishing. The various parks, both state and local, also have boat launches and bank fishing with most having handicap piers. The water is usually rough and turbulent due to the flow over the dam. Fish congregate in the oxygen rich water. In the channels is the deep, swift water that lacks structure other than large rocks and deep holes. Between the main channel and the side channel is that part of the river containing debris and stumps. Above the dams are the lakes and sloughs with their slow running water. The oxygen level is lower and the fishing usually not as good. The best fishing locations seem to begin at Oregon Dam. A bait shop in Oregon, Illinois at the dam is a good source of tackle, bait and information about the river. There are several boat launch areas on the western side of the river in Castle Rock State Park and on the eastern side at Lowden State Park. The river yields such diverse species of fish as northern pike, walleye, bluegill, white bass, smallmouth and largemouth bass. It is renowned for the ample population of channel and flathead catfish. Camping and picnic areas are available in the state parks. The various towns and cities along the rivers course also have motels and cabins available. As you travel further south the river widens and as a result it is often rather shallow. The shallows still have deep holes where fish seek refuge from the summer heat. They are often the home of some big catfish. “Fishing the Rock” is a great idea from mid-May to the snowfall in the beginning of winter. Living in Chicago area for some 30 years still provides surprises in terms of family fishing locations. The best fishing seems to come in the forest preserves and along the lakefront. 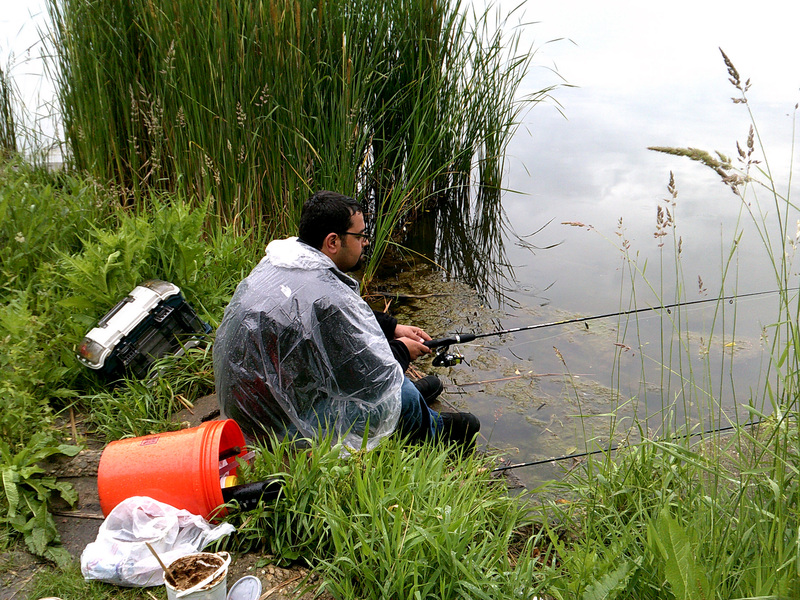 There are several rivers but they tend to be better probed by experienced anglers. The competition with other recreational users along the lake front in summer makes family fishing less popular than the forest preserves. Each of the forest preserve districts of Cook County, Lake County, DuPage County, Will County and the Chicago Park District have websites containing locations, maps, and facilities available. Up to date fishing information is available at http://www.windycityfishing.com. A prime example, but by no means the only good family location is the Busse Woods Lake in northwest suburban Elk Grove Village. 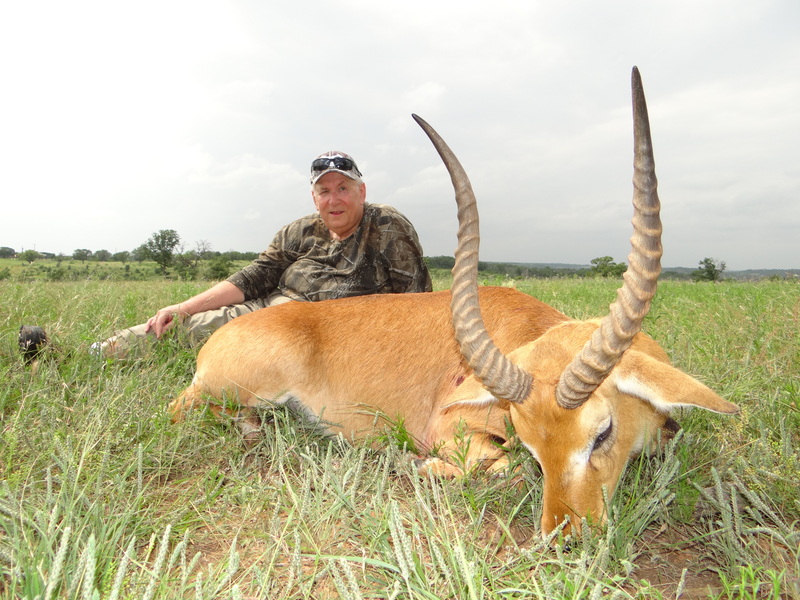 It offers excellent facilities and a variety of game fishing prospects. An aggressive program of stocking has established a fishery containing populations of largemouth bass, northern pike, walleye, crappie, channel catfish, musky, bluegill, warmouth, sunfish, yellow bass, pumpkinseed, bullhead and carp. The lake is one of the best lakes in the region for finding a variety of game species in good size. The park borders Illinois Route 53 on the west, Arlington Heights Road on the east, Higgins Road on the north and is included in the Ned Brown Forest Preserve. There is a bait and tackle shop in the shopping center at the corner of Higgins Road and Arlington Heights Road. The lake divides into three sections. All stocking takes place in the main lake (419-acres) and the south pool (156-acres). As a result most anglers focus there. The 25-acre north pool produces some excellent largemouth bass exceeding the 18-inch keeper minimum. Fishing in that area is exclusively shore fishing. The lake contains some 20 miles of workable shoreline for the shore angler. This includes some half dozen fishing walls. The areas nearest the parking lots receive the most fishing pressure. It is advisable to walk a short distance along one of the paths to find more promising water. For the boat angler, either in his own or locally rented boats, there are sections of submerged timber, rocks and vegetation to explore. There are fishing piers and handicap access areas. You can use of canoes, rowboats, and sailboats on the south and main lake. There are launching ramps and watercraft rental available. You can use your trolling motor but not a gasoline engine. Carlyle Lake offers some of the best white bass fishing in terms of quantity and quality. The fish average about one half pound. The total population runs 10 to 15-inches in length with 62 percent over 12-inches. Fish over 13-inches will run over one pound. The fish are in excellent condition and scattered throughout the lake. The lake is located on the Kaskaskia River near Carlyle, Illinois. It is 50 miles due east of metropolitan St. Louis. The lake stretches through parts of Fayette, Bond and Clinton counties. Owned by the U.S. Army Corps of Engineers contains some 26,000-acres of water. White bass are cousins to the saltwater striped bass and as such have much of the savage instinct of their brethren. They will hit light tackle ad give an angler more then he can handle. Following the warm rains of April, these water tigers go on a feeding frenzy that lasts into June. White bass become more active as water temperatures rise above 50-degrees. Once at that level the fish move out of staging areas and into spawning areas. Catching white bass is one thing, finding them is the tough part. In spring the pre-spawn fish position themselves on sand bars and gravel banks in fast water. During the spawn they make runs into the major feeder streams looking for suitable gravel beds. After the spawn they head down stream into creek channels or roam out into the main body of the lake. If fish are not in the spawning stages a good pattern is to troll over sunken islands and humps with small crankbaits. Look for sign of shad clouds on the fish locator. The schools of white bass are usually nearby. Often they are on deeper sides of the islands or flats. They wait to ambush some hapless shad as he swims past. The active white bass is a constant feeder. They prefer to spend their time in water deeper than 10-feet but will often move into the shallows to feed. Their favorite meal is shad. A sure sign of white bass presence is water that appears to be boiling. Shad breaking through the surface gives the appearance of boiling water as they try evading the bass. When feeding on the surface concentrations of seagulls pinpoint the location for anglers. At close range they find the shad boils by spotting splashing water caused by the feeding white bass as they chase the shad. At times the fish will stay up for ten to 15 minutes. More often they feed for only a minute ort tow and then dive back to the safety of deeper water. Usually they surface again a hundred yards or so away. Early morning and late evening hours are best to find white bass. When they are actively feeding they are catchable in the heat of the day as well. 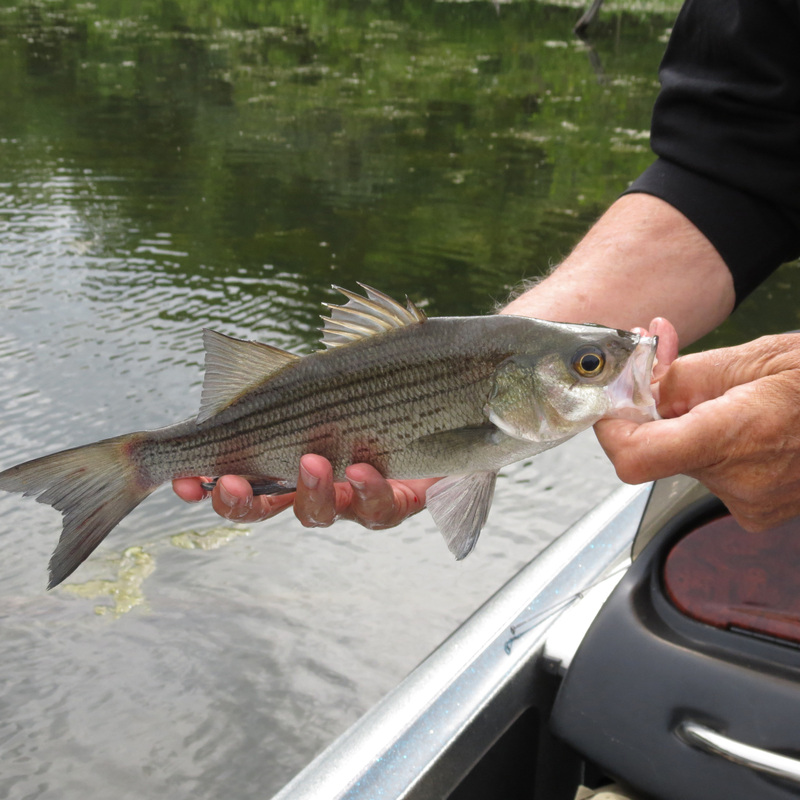 Anglers should position their boat in the general area of the feeding and wait for white bass to come to them. You can anchor under bridges to avoid the direct sunlight and to await the action. Light tackle is ideal. Small crankbaits, spinners and jigs are good with line in the 4- to 8-pound monofilament line. Small tube jigs tipped with a minnow or plastics with contrasting dark and light color work well. Match the size of your bait to the size of the shad in the lake. Angling success is dependent upon year hatches. A year with incredible numbers can help carry the population over more lean years. The best fishing is likely to be about 2 years after a large hatch year. Speculation is the origins of the fishing vest lie in New England in the 1930’s. Anglers wore hunting coats while fishing because the large pockets could hold fishing tackle needed while wading streams. The long sleeves and the weight of the jacket restricted movement while casting and anglers sought a more suitable alternative. A sleeveless garment with pockets sewed on became the answer. From those garments continued refinements developed. Over the years anglers tried dozens of fabrics, zippers and designs. The focus of each part of the vest was a design for the fisherman. Closing pockets with the addition of zippers and snaps to holed tackle secure were the first steps. Certain pockets were for certain tasks. 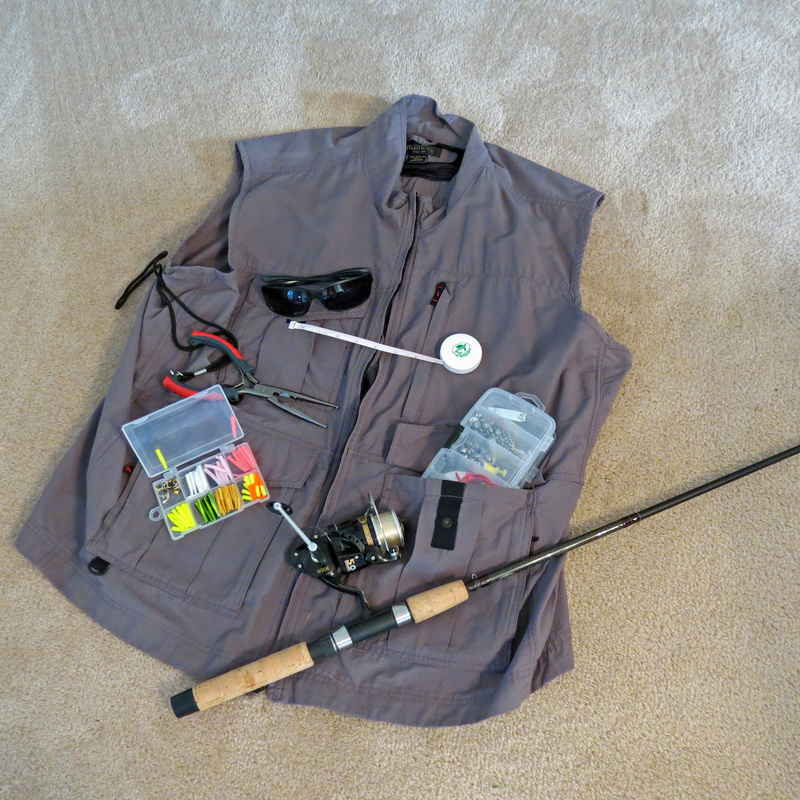 The idea was for the vest to allow the angler to stay organized and still have the freedom of movement required to cast. Some vests have as many as thirty pockets. They became mobile tackle boxes. For the angler wishing to explore rivers and backwater streams in search of freshwater fishing, a fishing vest lets us carry all the gear needed without lugging along an entire tackle box. The vest is not for warmth it is a traveling tackle box and day pack. It should be large enough to go on over a sweater or jacket if needed. A vest made of waterproof material is advisable. The best vests have a couple of large pockets on the front to carry fly wallets and plastic boxes. A large pocket on the back can hold rain gear, sandwiches or first aid kits. Smaller pockets are handy to hold boxes of flys and spools of leader. A zippered pocket is a good idea for that cell phone that might be handy in case of an emergency. Some other things an angler, trout fisherman or not, include such “essentials” as insect repellent, hook hone, flashlight, pen knife, pliers, clippers, polarized sunglasses, water or soft drink and a sandwich or energy bar.